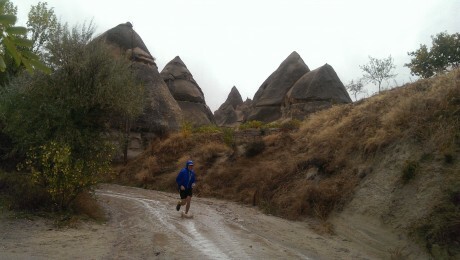 If Indiana Jones ran trail ultra marathons, I’m sure The North Face Cappadocia Ultra Trail would be one of his favourites. I first visited this part of Turkey a few years back and was stunned by the beauty of the landscape. I’d been out for a short run and thought it would be an amazing place for a trail race. It seems that someone had the same idea, and lo and behold the first edition of the Cappadocia Ultra Trail was held in 2014. On seeing photos from the event, I decided that I’d have to be part of the 2015 race. 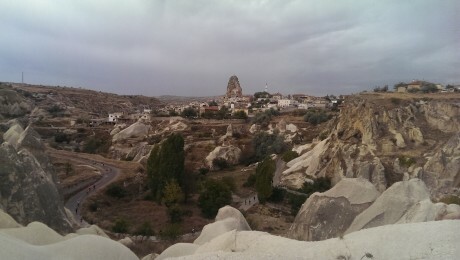 Getting to Cappadocia from the UK is relatively cheap and straightforward. I flew with Turkish Airlines from Heathrow to Istanbul, and then flew to Kayseri. The race organisers were really helpful and arranged transfers for the runners from the local airports to Ürgüp, where the race starts and finishes. I flew out with Kevin Payne, the race director for the Stour Valley Marathon, and his wife and sister in law. We had all booked to stay in a cave hotel in Ürgüp called the Courtyard Cave Hotel, which was about 7 minutes walk from the centre of town. 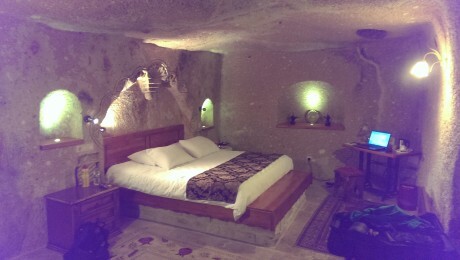 The accommodation was really excellent and I never knew it would be so cosy staying in a cave. The owner of the hotel, a chap called Murat, was also incredibly helpful and friendly. He really loved the fact that he had so many runners staying at the hotel, and went out of his way to make sure we had everything we needed. He even went to watch the race and gave me a high five at the 60k point, which was very uplifting. The race organisation was really excellent, and we easily registered and had our kit checked the evening before the race. We were handed a rather nice race t-shirt and attended a race briefing in the local cinema, which was held in both Turkish and English. Prior to the race I knew very little about the course. I knew it involved 110k and that there would be approximately 3,500m of ascent, but beyond that I had little information about what to expect. My only real concern was meeting farm dogs on the trail. The Anatolian Shepherd dog is renowned for its size and strength, and they can be incredibly intimidating if they are protecting their turf or livestock. I’d had a confrontation with one a few years back whilst running in Cappadocia, and a family driving near the trail had come to my assistance. I didn’t want a repeat of this situation, and it turned out that many of the runners had the same concern. Fortunately the race organisers had requested that the local farms secure their dogs, but I knew this was no guarantee of safety. There were three races taking place on the late October weekend. There was a 30k (which was actually 36k), a 60k worth 1 UTMB point, and the 110k which was worth 3 UTMB points. The 60k and 110k races both started at 7am, so around 500 runners headed off from the town square for the epic adventure ahead. Another 500 or so 30k runners started a couple of hours later, and they were to follow a similar route to ours. The race started promptly at 7am and it was a pleasant morning, which meant t-shirt weather for us Brits, and jackets for everyone else. After a very short climb through cobbled streets we left town and were out on soft and sandy trails. 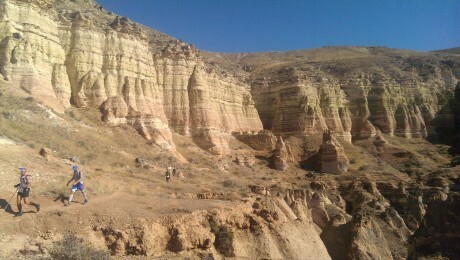 The scenery was immediately spectacular and we were surrounded by towering rock formations riddled with caves. We then started passing through old towns, where many of the residents still lived in modified caves. It was fascinating to see the locals going about their business in much the same way they had been for hundreds of years. Around 10-15k into the race, things started getting very interesting indeed. Heavy rain started falling as we left the first aid station and started ascending into the hills. The trail became relatively muddy and slippery, and I was glad to have my poles for additional stability. However, as we started to descend into a valley, the race started turning into a real adventure. We started running through a narrow valley which had clearly been carved out by thousands of years worth of rainfall and fluvial activity. The undergrowth was dense around the trail, and I had to duck and weave to avoid some of the sharp branches and thorny bushes. To make things even more exciting, we started running through caves, some of which were dark and only just over a metre in height. We also came across slippery bridges and sharp descents were the use of a rope was required. One runner described the race as a mix between an ultra marathon and Ninja Warrior. It was certainly one of the most exciting and challenging routes I’d run along. Along the 60k route which headed back towards Ürgüp, there were a great number of sharp ascents and descents, caves to clamber through, ladders to climb up and down, logs to scramble over, and shallow rivers to run along. Whilst these made the route very challenging, it also made the race one of the most interesting I’d ever had the pleasure of being part of. Despite this, there were also a number of sections that were also very runnable. The fact that the winner finished in a time of just under 12 hours highlights that the distance can be covered quickly by any expert ninjas or explorers. Aid stations were regular and well stocked, and before long the rain clouds parted and the sun started to beat down upon our backs. The temperature started shooting upwards and the rain jackets were packed away. It was almost too hot for my liking, but the Middle Eastern runners I was chatting to seemed to enjoy the conditions. Actually, the field was very international and I had the pleasure of chatting to runners from the likes of Oman, Iran, and Serbia. 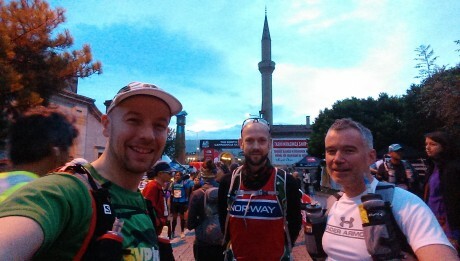 Turkey was very well represented in the 30k race, but I suspect that ultra running is only really taking off in the country. 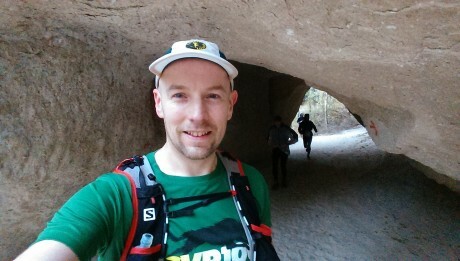 60k into the race, we passed back through Ürgüp. It was a painful sight to see the finish line and so many happy 60k and 30k runners relaxing in the sunshine. As I stopped to take on fuel and clear my shoes of small stones, my Inov-8 gaiter rubber band snapped. This was the last thing I needed, as the route had been very sandy and stony, so I expected much the same for the last 50k. It seems this is a common problem with the Inov-8 gaiters according to my internet searches, so I’ll be experimenting with another brand in the future after having been let down by these gaiters a couple of times in the last few months. On leaving Ürgüp to tackle the last 50k, it was good to see that there were still a number of runners visible ahead and behind. This gave me a sense of security as the sun started to set, and there were still a large number of the 200 or so runners still in the race. Sadly Kevin had decided to stop at the 60k mark, but I didn’t know this until after the race. He cited lack of training, and this course certainly took no prisoners. The last 50k of the race can only be described as brutal. Just when you thought the race organisers had thrown everything at you, they threw some more. The route went off trail, and we started following route marker flags up steep ascents with loose rocks beneath our feet. At points I’d look at the flags ahead and think ‘are they really sending us up there?’ It became even more challenging as the head torches came on. Despite having an almost full moon and clear skies, it was incredibly dark and the flags were hard to follow in places due to the distances between them. Despite the course being pretty well marked, it was easy to add bonus miles if you lost concentration for one moment. I went wrong a number of times and had to backtrack on a few occassions, whilst mumbling profanities to myself. 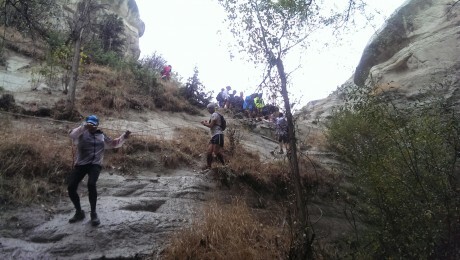 Some of the descents in the last 50k were also pretty technical, which made things slow and tricky with weary legs. My feet started to blister due to the number of stones working their way into my shoes, and Compeed and Vaseline were my best friends over the last 20k. Much of the time, I was running on my own in the dark, and I started singing out loud to keep myself entertained. After just over 18 hours running, marching, scrambling and sliding, I finally made it to the finish in Ürgüp, to be awarded with a lovely medal and finisher gilet. It was past midnight, but the town still felt relatively lively with a few clubs and bars still open. I picked up my kit bag and goodies, and slowly hobbled my way back to the cave, passing up the opportunity for a massage in the local Turkish bath house. I just wanted a shower and bed by that point. All in all, this was a fantastic race. It was very well organised and reasonably straightforward to get to from the UK. It was also very good value for money at around €45 entry fee, and the organisers didn’t cut any corners. It’s definitely one of the more challenging ultra marathons I’ve done, but it was well worth it for the unique scenery and experiences along the route. Best of all, I managed to finish the race without being attacked by a single dog, although a fair few took some interest as we ran through villages during the middle of the night. Definitely one to add to the list if you are looking for 3 UTMB points and a bit of adventure in your life! It’s great that there are shorter options too, and everyone I spoke to really enjoyed both the 36k and 60k races.